Insulin pump and insulin pump supplies (cleaning agents, batteries, plastic tubing, infusion kit, catheter, and needle); Insulin pumps and supplies must be accompanied by insulin. Unlimited number of used syringes when transported in Sharps disposal container or other similar hard-surface container. Sharps disposal containers or similar hard-surface disposal container for storing used syringes and test strips. Insulin in any form or dispenser must be clearly identified. 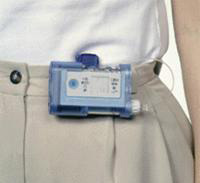 If you are concerned or uncomfortable about going through the walk-through metal detector with your insulin pump, notify the Security Officer that you are wearing an insulin pump and would like a full-body pat-down and a visual inspection of your pump instead. Advise the Security Officer that the insulin pump cannot be removed because it is inserted with a catheter (needle) under the skin. Advise the Security Officer if you are experiencing low blood sugar and are in need of medical assistance. You have the option of requesting a visual inspection of your insulin and diabetes associated supplies. See the Medication section below for details.